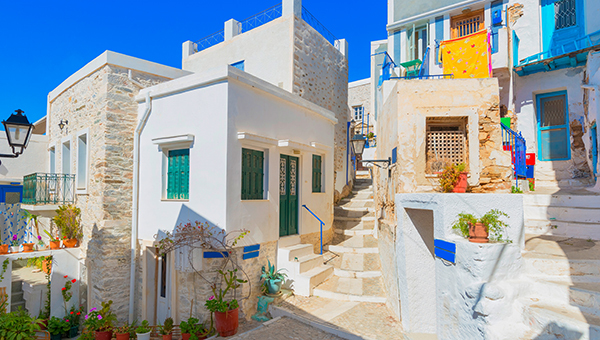 Syros is a picturesque rocky Greek island filled with unexpected treasures and tastes. In the 1800’s, it was the prosperous industrial hub of Greek imports and exports as well as the shining star of shipbuilding. Still the capital of the 56 Cycladic isles that dot this section of the Mediterranean, it is now a quiet island rich in cultural and religious history that makes it well worth a visit. Hermes the Greek God of Commerce would be proud of the capital Ermoupolis “the city of Hermes” named to honor him and acknowledge the port’s commercial success. Its former grandeur still illuminates with impressive neoclassical architecture lining streets paved with marble in the Old Town. There is also a magnificent Town Hall and many appealing cafes on beautiful Plateia Miaouli (Square Miaouli) as well as the amazing Apollo Theater built to imitate Italy’s La Scala and the alluring mansions in Vaporia, the neighborhood wealthy ship-owners called home. The Orthodox Church is prominent here with many exquisite churches leaving their mark. The most noted are the Orthodox Church of the Transfiguration of Jesus built in 1824 making it the oldest on Syros, the Assumption of the Virgin Mary, the Church of the Resurrection that sits on the top of the hill offering incredible vistas from above and the ornate Church of Saint Nicholas in Vaporia. Museums highlight the area’s past well and include the Archaeological Museum, the Gallery of Cycladic Art and the informative Industrial Museum that shows just how important Syros was to the shipping industry. 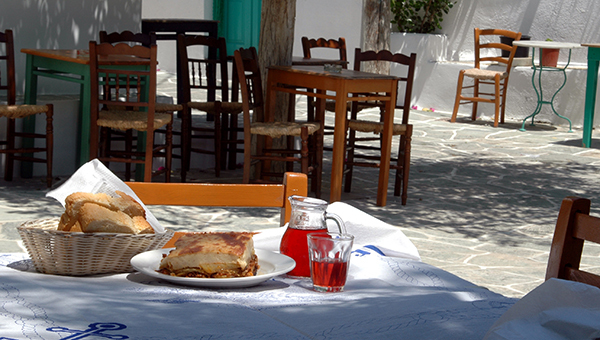 The tavernas and restaurants feature typical Greek offerings like souvlaki (shish kebab) or moussaka (eggplant lasagna) or Horiatiki Salata (Greek salad) but it is the local delicacies that are such a delectable surprise. Its special cheeses (see below) and unique use of herbs and citrus in dishes make a lasting impression. Seafood is readily available and plates of fresh grilled or fried calamari (squid) or sartheles (sardines) are terrific. But the scintillating surprise here is pork! In any form—as sausage, bacon, cured slices or tenderloin–this is the specialty of Syros and should not be missed. The sweet touches of the Syros kitchen are strong too–honey, jellied candies, citrus, almond or pistachio cake and nougat—are all here for the taking (see Savor below). Enjoy!! SAIL: Syros. Before sailing away, bring the island’s flavors and flair home. Hellenic mouthwatering must-haves include the thyme infused honey, fennel flavored aperitif ouzo and the powder sugar dusted chewy jellied candy Loukoumia (see below). Byzantine art and religious icons are lovely gifts too. SIP: Ouzo with a Fennel twist or Grandmother’s Liqueur. Opa! 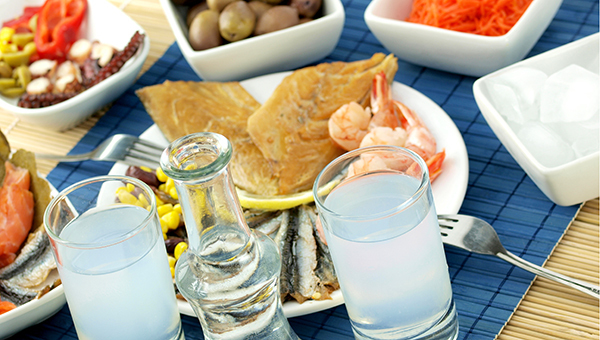 Ouzo is the national aperitif of Greece but when sipping it on Syros it has a little more bite! Distilled from remnants of grapes with anise, it’s usual licorice taste has a hint of something more thanks to the infusion of ground fennel. Remember, it turns milky when adding water or ice. Drink with mezethes (appetizers) like olives and pita topped with the local spicy cheeses of Saint Michali or creamy Kopanisti. If brandy laced with cinnamon, orange and cherry sounds appealing, Grandmother ‘s (Yia Yia) Liqueur is unique to this island!